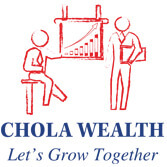 Chola Securities is a wealth management company offering investment solutions to individual clients and stock broking and equity advisory services to institutional investors, including many of the largest mutual funds in India. Chola Securities is a member of Bombay Stock Exchange Limited and National Stock Exchange of India Limited. Cholamandalam Investment and Finance Company Limited (Chola), incorporated in 1978 as the financial services arm of the Murugappa Group. Chola commenced business as an equipment financing company and has today emerged as a comprehensive financial services provider offering vehicle finance, home loans, home equity loans, SME loans, investment advisory services, stock broking and a variety of other financial services to customers. Founded in 1900, the INR 300 Billion Murugappa Group is one of India's leading business conglomerates. The Group has 28 businesses including eight listed Companies traded in NSE & BSE. Headquartered in Chennai, the major Companies of the Group include Carborundum Universal Ltd., Cholamandalam Investment and Finance Company Ltd., Cholamandalam MS General Insurance Company Ltd., Coromandel International Ltd., Coromandel Engineering Company Ltd., E.I.D. Parry (India) Ltd., Parry Agro Industries Ltd., Shanthi Gears Ltd., Tube Investments of India Ltd., and Wendt (India) Ltd.
Market leaders in served segments including Abrasives, Auto Components, Transmission systems, Cycles, Sugar, Farm Inputs, Fertilisers, Plantations, Bio-products and Nutraceuticals, the Group has forged strong alliances with leading international companies such as Groupe Chimique Tunisien, Foskor, Mitsui Sumitomo, Morgan Advanced Materials, Sociedad Química y Minera de Chile (SQM),Yanmar & Co. and Compagnie Des Phosphat De Gafsa (CPG). The Group has a wide geographical presence all over India and spanning 6 continents.